Lee Health, formerly Lee Health Memorial, is the largest hospital operator in Southwest Florida. The not-for-profit is comprised of a network of six hospitals and more than 100 outpatient clinics. Serving more than 100,000 Southwest Florida residents, Coconut Point is the newest addition to the Lee Health family. This state-of-the-art healthcare campus features a cutting-edge outpatient facility in addition to a freestanding emergency department, the first of its kind in Lee County. With major expansion plans, Coconut Point will scale over the next three years from a 10 bed, 163,000 square foot facility to a 114 bed, 500,000 square foot health and wellness destination. Entering a new and jurisdiction in a competitive landscape, Lee Health needed a strategy that would enable them to differentiate themselves and keep pace as their infrastructure grew. The Lee Health team recognized the potential value of a well developed mobile app and wanted to further invest in it to help create an easy and stress-free experience for patients and facility guests. Coming to a hospital is already an uncomfortable experience. Lee Health wanted to allow patients to walk into a facility and be able to focus on their health instead of worrying about getting lost. Lee Health had just completed construction of their new facility in a high socio-economic region and as a result of changing government regulations, they were having to compete for market share where they had previously held a monopoly. Lee Health knew that being able to stand out from the competition from a patient experience perspective was a key component to their success. With a focus on IT as their differentiator, Lee Health set out on a journey to develop visitor-facing technology that would provide real value to their patients. The team had already developed a hospital mobile application that incorporated patient electronic health records (EHR) and were now ready to evolve it into a purpose-driven app that leveraged indoor mapping and positioning technology. Lee Health’s first attempt at implementing wayfinding was a crash course in location-aware technologies and challenges. After having struggled with attempting to build a solution in-house, Lee Health came to the realization that in order to successfully implementing a real-time wayfinding solution they would require an experienced mapping and positioning partner. One that could provide their team with the tools to embed indoor maps and location awareness into their mobile app to create a more familiar and engaging environment that promoted an effortless and seamless patient experience. After having relaunched their hospital mobile app the previous year, Lee Health began exploring different technologies that their small internal development team could work with to expand their app. Their vision was to create a more holistic experience across the continuum of care, that would be developed and rolled out in phases. Lee Health’s new Coconut Point facility was the perfect starting point for their digital transformation. It provided a great opportunity to launch their enhanced mobile app in a facility that would grow and evolve with the technology, without initially disrupting any other operations or processes within the facility. "We tried to tackle this project 100% internally with just some beacons and quickly realized it is deceptively difficult to implement wayfinding without a platform." As a government agency, Lee Health’s vendor research process was very extensive and required auditing several formal bids from different indoor mapping providers. After reaching out to the CHIME CIO network as well as Lee Health’s EMR provider, their network vendor (Cisco), and strategic partners, they noticed a recurring shortlist of names and sought references for each of them. Lee Health began their exploration by speaking with each of the named vendors and their references. They quickly identified the need to peel back the layers and take a look at all the elements of each solution. What did the code look like, what type of documentation is available, and most importantly, what have others developed using the technology. Aware that they didn’t have a large infrastructure and workforce to tackle this project, the Lee Health team was also concerned about having to independently coordinate all of the different pieces of the puzzle, from beacon providers to indoor mapping and positioning providers. Initially, Jibestream was not a top contender. Their project management team had concerns about the solution not being 100% focused on healthcare. However, as they continued their analysis and performed their due diligence, these concerns were quickly put to rest. Not only did the Jibestream platform offer the functionality they had been seeking, it also gave them the flexibility to develop a solution that could be released in phases to addressed their evolving needs and be easily managed by Lee Health's internal team. Jibestream’s experienced team of mapping experts and established partner network also circumvented the need for Lee Health to deal with multiple stakeholders making the fulfillment of their project simple and straightforward. With the vendor search complete, Lee Health’s development team of one got to work building out their new mobile app for both for iOS and Android. It took approximately one month to complete using Jibestream’s indoor mapping platform and indoo.rs’ indoor positioning system. "After much research and multiple site visits, I realized that my first choice on paper was actually my least favorite real-world implementation! When it comes to assessing the technology, you really need to see the solution." When Coconut Point opened their doors to the public for the first time, they did so with a mobile app that included indoor maps and navigation. The media celebrated their innovative new facility, as well as the enhanced patient app. 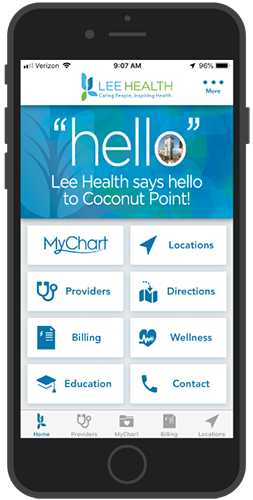 The Lee Health hospital app features a MyChart patient portal with EMRs, billing information, contact information, a search directory, wayfinding, and more. 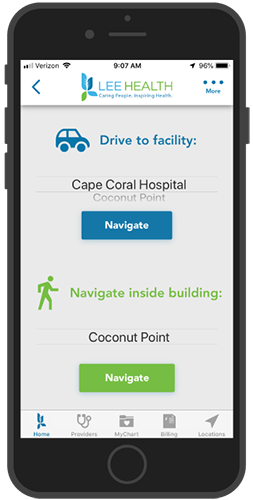 Upon entering the Directions function, users are provided with the option to either navigate to the Coconut Point facility from their home or current location, or to navigate to a destination within the Coconut Point facility. 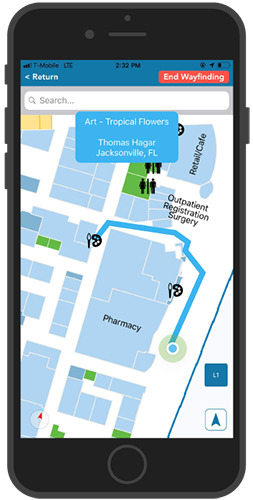 The Lee Health hospital app now features interactive maps and turn-by-turn blue dot navigation. See in real-time where you are, select a destination, and receive visual directions to your desired point of interest. 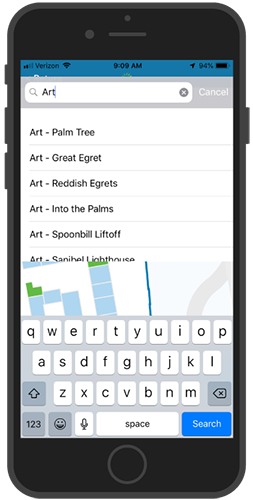 The app also incorporates points of interest within the facility by showcasing art commissioned from community-based artists throughout the facility, driving additional value and revenue to the Lee Health Coconut Point facility. The future is bright for the Lee Health network. With plans to significantly grow the Coconut Point facility, deploy their indoor wayfinding offering across five other major hospitals, and one day implement more complex RTHS use cases enterprise-wide, Lee Health has a lot on the horizon. Allowing patients to use a mobile app for indoor wayfinding was the first step for Lee Health in revolutionizing the patient experience. For the next phase of their digital transformation, Lee Health plans to scale their wayfinding services to more facilities across Lee County, and begin implementing more of the ‘nice-to-haves’ such as geofencing, parking lot shuttle management, ‘find my car’ functionality, and asset tracking. The team at Lee Health have identified further opportunities to improve the patient experience using Jibestream’s geofencing capabilities to create a graceful transitions welcoming people to the facility upon arrival and removing friction from the shuttle experience. In future instances, when visitors park in specific lots, trolley drivers will be notified of shuttle requests. Lee Health also has plans to build on their indoor maps and implement asset tracking for IV pumps and other biomedical equipment. Lee County residents can expect their visits to Lee Health to be smoother, less stressful, and more digitally accessible. Jibestream is an indoor mapping and location platform. Comprised of a series of SDKs, APIs and a web-based CMS, Lee Health leveraged Jibestream to develop and manage their map-enabled hospital app. indoo.rs, an indoor position solution, was leveraged to allow app users to locate themselves and others in real-time on the maps provided by Jibestream, enabling a myriad of positioning related use cases.